Hi guys! Sorry I haven’t gotten to post in a while. Life has been a whirlwind of crazy and busy and laughs and tears all mixed together! Today I went to a baby shower for a friend and co-worker and her and her husband are expecting a little boy in October. When she posted about her baby shower I knew exactly what I wanted to do for her, Make a diaper cake! I had a beautiful diaper cake made for me for my shower and I found it so useful because of all the best things that were included with it (including the cake topper Taggie Monkey which my son loves!) I have never done anything like this and was excited to attempt it! I will apologize for the poor photos, I did this diaper cake in the hour my son had finally fallen asleep for the night and the time he woke up from teething pain. Ribbons & Twine – You can really get creative with this, add embellishments & cute pictures. Since I had already had these colors in my crafty tower, it was perfect! Cute Cake Topper – I used an elephant teether. Kaleb has the same one but only his is a giraffe and he loves it! I try to give people things that I can personally endorse! 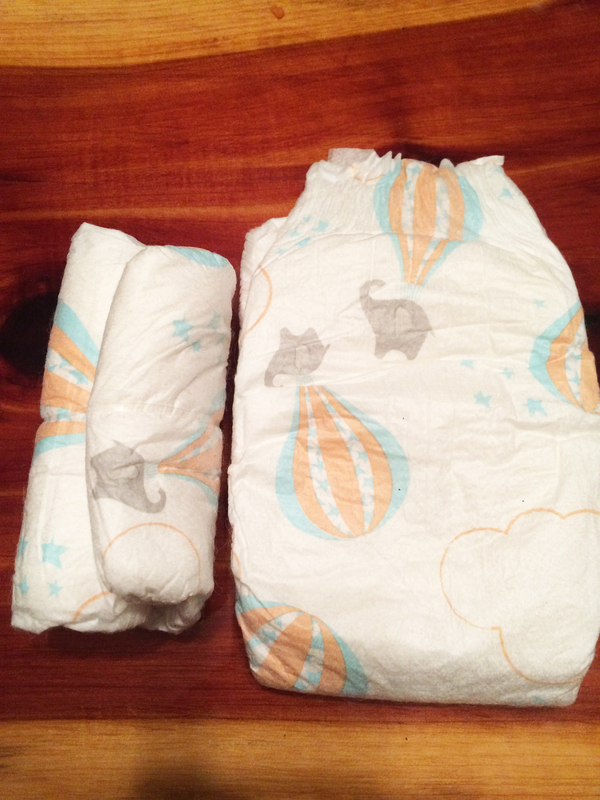 I first rolled up all the diapers into cylinders. I rolled about 60 or more and secured them with the clear rubber bands. Then, I made the first layer of the cake. I used about 10 diapers and arranged them all on their ends. I put the elephant teether in the middle for the “cake topper”. I then wrapped the first layer with the jute string to secure it tightly. wrapped it around and made a tight bow on the front. Next, I untied the jute string and re-tied it nicely over the colorful ribbon. I incorporated the knot of the jute with the knot of the ribbon so they both stayed straight. I continued steps 2-4 with the next two layers, making them noticeably larger to make the layers distinguishable. After the layers were all done, I started putting the “pillars” inside. I took all the green and blue forks and spoons and put them aside and used the rest of the colors as columns inside to hold the layers of the diaper cake together. After the cake was assembled, I started putting the rest of the spoon & forks into the cake layers and made them look like candles sticking out. Just something fun to add to the cake. When Kaleb started eating baby food I was so grateful to have these around for him! The final step was to transfer the diaper cake to the cardboard cake round so I could easily carry it to the baby shower! 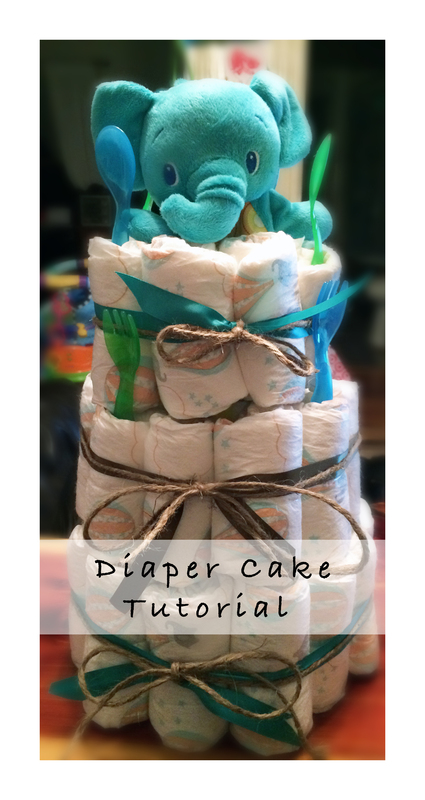 You can do so much with your diaper cake. Be creative! Walk down the baby isle at your local store and take inspiration from what you see! A baby’s world is so colorful, you can’t help but be inspired! Until Next Time – Stay Fashionably Crafty! Pins & Blogs that Inspire Me! It was so cute. Everything was very thoughtful made and creative. I love the cute little spoons and I’m pretty sure the elephant teeter will be a hit when time comes! Lol thank you Cari.. All the best on your blog. I’ll be here whenever I can. Thank you Dallila! I’m glad you loved it and had a wonderful day!